This coming weekend we have booked a campsite at Pancake Bay Provincial Park on the shores of Lake Superior. This will be our daughter’s first camping trip and that makes it an extra special outing for us! It’s also our first visit to Pancake Bay. We’ve heard good things about it and are looking forward to checking it out for ourselves. 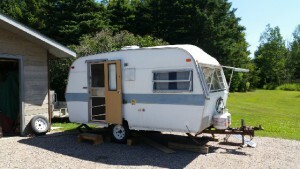 Additionally it will be the first time we take our little camper trailer out since we purchased and refurbished it. I bought it a couple of years ago and have been slowly working away at getting it roadworthy and ready for camping again. It’s been a lot of work and there is still more to go but it’s been an enjoyable and rewarding process. Upgrades to the trailer have included: new axle/rims/tires, exterior LED running/tail lights, battery, solar panel, power inverter, leveling jacks, sofabed cushions, curtains, window screens, roof vent, front window covers, exterior storage hatch latch and door step. I also removed a storage closet to make the interior space more roomy and replaced rotted wood where there had been leaks in the past (oh and fixed leaks!). Still to come is interior and exterior painting, new flooring and whatever other new projects I come up with! In the mean time we will be enjoying our first trip in our little camper that is uniquely ours. This entry was posted in Outdoor Recreation and tagged camper, camping, provincial park. Bookmark the permalink. Thanks for the suggestions Lynda!